Slip on your kaftans and tie-dye t-shirts. Adorn yourself with flowers and beads. We’re going to light-up some joss-sticks, “ban the bomb” and “make love not war!” This week’s theme is dedicated to that period in 1967 that saw as many as 100,000 people converge on the Haight-Ashbury neighbourhood of San Francisco, creating what was to become known as the counterculture movement. 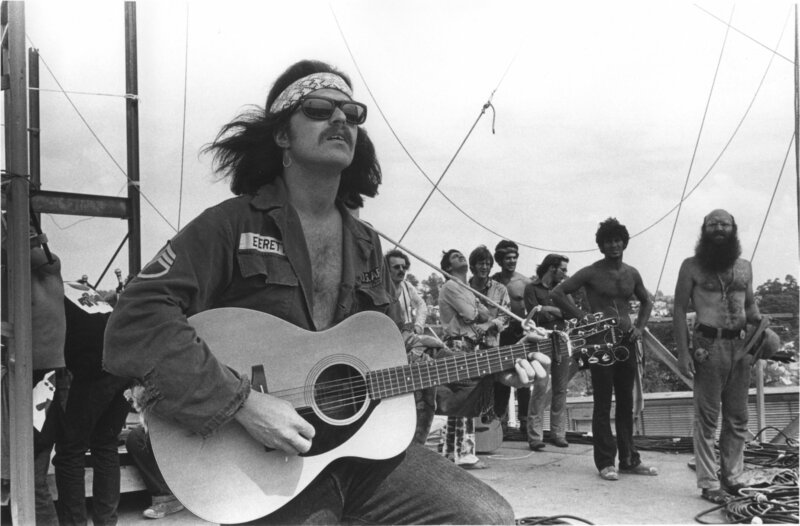 The melting pot of music, psychedelic drugs, sexual freedom, creative expression and politics became a defining moment of the 60’s and forever more will be known as THE SUMMER OF LOVE. It’s easy to reject songs that seem to have been around forever, but consider the context of these songs’ origins and you’ll realize that what many of these musicians were doing hadn’t been done before and, in many cases, would never be done again. So respect to the hippies and the funk soul sisters & brothers and the year 1967 – a time of exploration and finding new ways of expression. We opened the show with the THE ACID COMMERCIAL from Country Joe & The Fish and then it was the Beatles with ALL YOU NEED IS LOVE. Arguably the greatest band in the world at the top of their powers, Lennon’s anthem to love may not be his strongest but it’s definitely his catchiest. The Beatles made a worldwide television broadcast of the song, in between sessions of transcendental meditation, and it became a #1 hit in both the US & UK. Check out the clip from this transmission and see if you can see Mick Jagger in the audience. 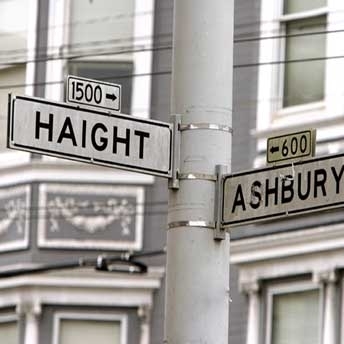 A song that summed up the mood of those flocking to Haight-Ashbury in that Summer of 67 is, of course, Scott McKenzie’s IF YOU’RE GOING TO SAN FRANCISCO, (be sure to wear flowers in your hair). Written by John Phillips of the Mamas & The Papas, it was originally created to promote the 1967 Monterey Pop Festival, which is regarded as being the beginning of the Summer of Love. In the early sixties The Beach Boys were synonymous with surfing and Californian youth culture. By the mid-sixties, however, their musical style had become a little more complex. A 1967 example of this new sophisticated sound was HEROES AND VILLAINS. We followed with a song that had the distinction of being the first track to be played on BBC Radio One when it launched in 1967, FLOWERS IN THE RAIN by The Move. And, to round out the triple play, The Turtles with HAPPY TOGETHER. This track can lift anyone’s mood. While their vocal harmonies verged on sugar-sweet, I don’t know anyone that doesn’t like this song. Three more classics of the period: Cream’s I FEEL FREE, the Byrds’ SO YOU WANT TO BE A ROCK N ROLL STAR and Jefferson Airplane’s SOMEBODY TO LOVE. And then it was Procol Harum with WHITER SHADE OF PALE. This track contains perhaps the most recognizable Hammond B-3 organ rock line ever, snatched from Bach and perhaps a soul player or two. The vague lyrics, however, aren’t very memorable, making the organ bit seem even more imposing and significant than it probably deserves. But hey, what do I know? Here they are on Top of the Pops 1967. Make up your own mind. Three more songs from that magical time in 1967 referred to as THE SUMMER OF LOVE include I’M A MAN from The Spencer Davis Group, written by Steve Winwood, SAN FRANCISCO NIGHTS from Eric Burdon & the Animals and GET TOGETHER from the Youngbloods. One of the most instantly recognizable riffs in rock history is SUNSHINE OF YOUR LOVE, from Cream. And one of the most representative of the period is the Small Faces tune ITCHYCOO PARK. 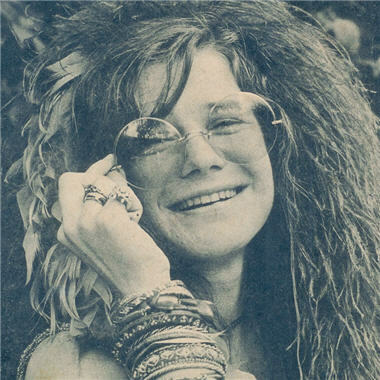 For me, though, when it comes to this period, I can’t overlook Janis Joplin. So an essential track from 1967 has to be Big Brother and the Holding Company with Janis Joplin singing DOWN ON ME. Jimi Hendrix also deserved another play and this time it was FOXEY LADY. It’s probably worth mentioning here that up until this point Blues guitarists would never have done what Hendrix does on this track. The rule was that the guitar sound should be clean and pure. 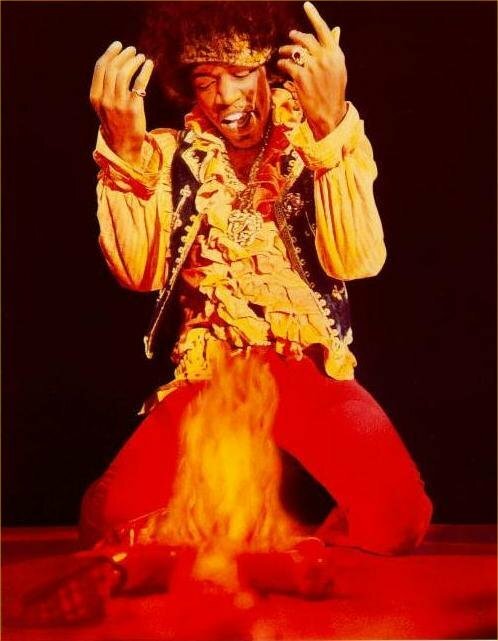 Jimi however, never got that memo and thank goodness for that. 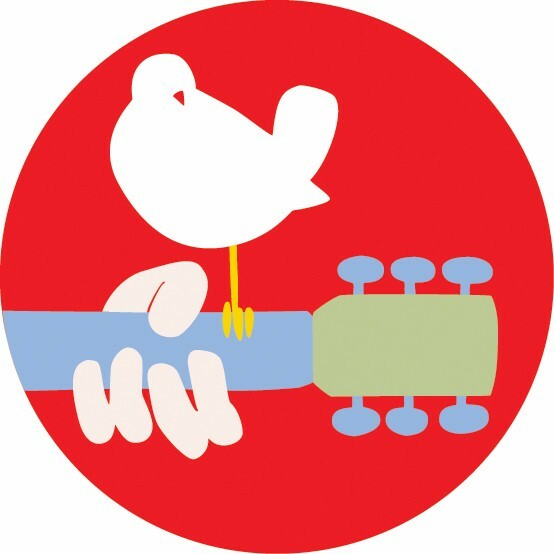 As well as a time that was marked by anti-Vietnam demonstartions, 1967, unfortunately, was also a time of race riots, which also fed into the peace movement and hippie revolution with its ideals of compassion, awareness and love. So, in deference to our soul brothers and sisters, it was time for some R&B with I HEARD IT THROUGH THE GRAPEVINE by Gladys Knight and the Pips. This song became a #2 hit in 1967 and Marvin Gay’s renditon hit #1 the following year. But sticking to the plan, we listened to The Pips version and followed with the one and only Jackie Wilson with his landmark single, HIGHER AND HIGHER. Although they were a white band, the Young Rascals GROOVIN’ was pure soul with its memorable Afro-Cuban mood and mid-tempo groove. Timeless song. Check out the clip of them performing live. The next track was a bit of a cheat, since it wasn’t released until 1969, after the band had broken up. But TIME OF THE SEASON by The Zombies was written and recorded in August 1967 and the vibe is pure SUMMER OF LOVE, baby. And then it was the Who with I CAN SEE FOR MILES, the only real hit from their crazy concept album The Who Sell Out and SHE’S A RAINBOW from the Rolling Stones. We’ll overlook the Stones vain attempt of trying to one-up the Beatles and just concentrate on those first seven piano notes, which have been likened to the musical equivalent of heroin. We closed the show with STRAWBERRY FIELDS FOREVER from the Beatles. The band recorded a version by themselves in one key and then they did a version with an orchestra in a different key. The version you know and love is BOTH versions mixed together, speeding the band version up and the orchestral version down. Magic. This promotional video was filmed in January 1967 and was directed by Peter Goldmann, at the time a Swedish TV director. Now next week’s show is going to be hotter than hot. As a tribute to the upcoming Summer holiday season the theme will be HEAT. Put your thinking caps on and get in touch! We Baby Boomers, in particular, seem to be obsessed with aging so I thought it was time to dedicate a show to the older generation. It was also Seniors week – not that you would know it, as there wasn’t one thing organised to celebrate seniors up here in Northern New South Wales, that I could make out. Now I know that we live in the youth obsessed tourist town of Byron Bay, but come on! One day it will be you and I that will be shuffled into the old people’s home (if we can afford it!). Ah well, there’ll always be the music…. Even Barbie, who turned 50 last week, has fallen prey to a mid life crisis: ‘Totally Stylin Barbie’ has landed in the toy stores, complete with trendy threads and several temporary tattoos. Help! I started the show with the Who’s ‘My Generation’. Roger Daltrey sang “I hope I die before I get old” when he was a 21 year old, in 1965, and he’s still singing it 44 years later! Rock’n’roll has always been devoted to a cult of youth and beautiful corpses. Meanwhile our musical heroes and heroines have turned into reunion tour veterans. Being an aging rocker comes with a lot of irony and a smidgeon of indignity along with the continuing glory, or so it seems. Aging, mortality, hard-done by women and dirty old men – the themes aren’t confined to rock. Other musical genres covered it all long ago. Pop, Blues, Soul and, not to forget, country – those cowboys have been churning out hits about the sunset years for decades. So it was a fairly eclectic playlist this week – Jazz, Blues, Rock’n’Roll, Country and even some Hip-Hop! Songs dedicated to our older relatives, philosophical musings on time’s passage and a couple of anxious songs about diminished potency. There were a couple of cheeky songs and some very touching music recorded, perhaps not surprisingly, by some of our older musical icons. It turns out that, dying after you get old does have some advantages! Fats Waller and Bill Withers sang a song dedicated to their Grandad and Grandma, respecitvely, and then it was onto Elvis Costello with a song that Paul McCartney co-wrote, ‘Veronica’. This is quite a brilliant number from 1989 about an elderly woman slipping into senility. Sassy songstress Lily Allen followed with her 50cent cover ‘Nan, You’re a Window Shopper’ and how could we miss out on ‘Little Old Lady From Pasadena’ from the Beach Boys? That’s Elvis C. in the pic above, in 2005, still rockin it out. Bless. Steely Dan’s ‘Hey Nineteen’ struck a note with more than one of my girlfriends! As the song goes, as hot as it is having a girlfriend 30 years your junior, it’s kind of a reality check when she’s never heard of Aretha Franklin: “We’ve got nothin’ in common, We can’t talk at all”. No kidding. So here’s a video of a live concert in 2006, for all those old guys still chasing young skirt….. listen well! We played a quite a bit of the Beatles today. Sad when you think about it. They wrote quite a few songs about aging and both George and John died relatively young. ‘When I’m Sixty Four’ and ‘In My Life’ are both classics. Buddy Guy and Junior Wells gave us a great rendition of ‘In My Younger Days’, followed by my new favourite, Seasick Steve, with ‘Rockin’ Chair’. We couldn’t leave out Neil Young’s ‘Old Man’ with James Taylor on banjo (tuned like a guitar) and Linda Ronstadt on back up vocals. Here is a video of a concert Young did in London, in 1971, where he explains the origins of the song. He looks so young here – well it was nearly 40 years ago! My Roy Orbison song this week was quite poignant: ‘Life Fades Away’. And so was ‘End of the Line’ by the Travelling Wilburys. I happily sent out birthday wishes to several of my listeners with the Beatles recording of ‘Birthday’, and then finished the show with the amazing Jimmy Durante singing ‘Young at Heart’. Yep, age ain’t nothin’ but a number. Next week I’ll be tackling the theme of Communication. Suggestions for songs always apprecicated.